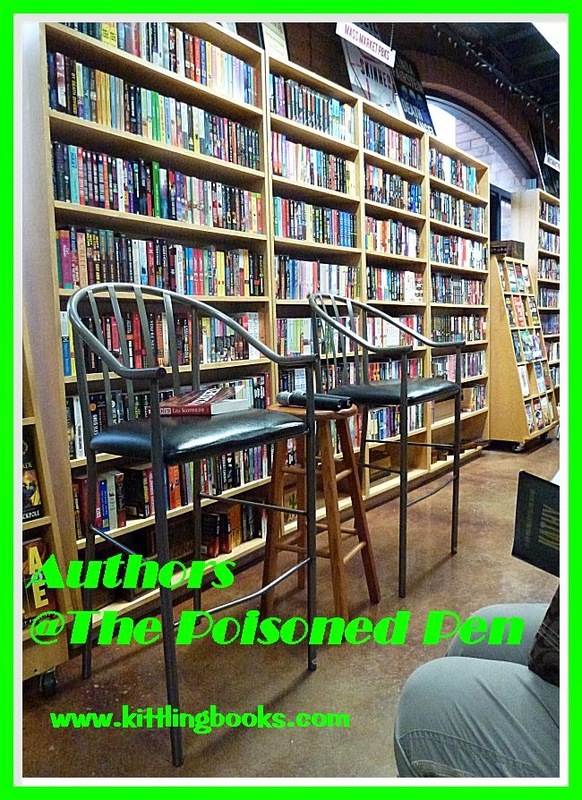 @ The Poisoned Pen with the Berkley Prime Crime Ladies! A bookstore celebrating a milestone-- like its twenty-fifth anniversary-- can dish up some very nice perks, like the one on the evening Denis and I headed over to Scottsdale and The Poisoned Pen. We were going to enjoy a couple of hours with four talented writers: Carolyn Hart, recipient of the Grand Masters Award from the Mystery Writers of America and author of four series and several standalones; Margaret Coel, author of the Wind River mysteries and Catherine McLeod novels; Avery Aames (AKA Daryl Wood Gerber), author of two series; and Earlene Fowler, author of two series and a standalone novel. 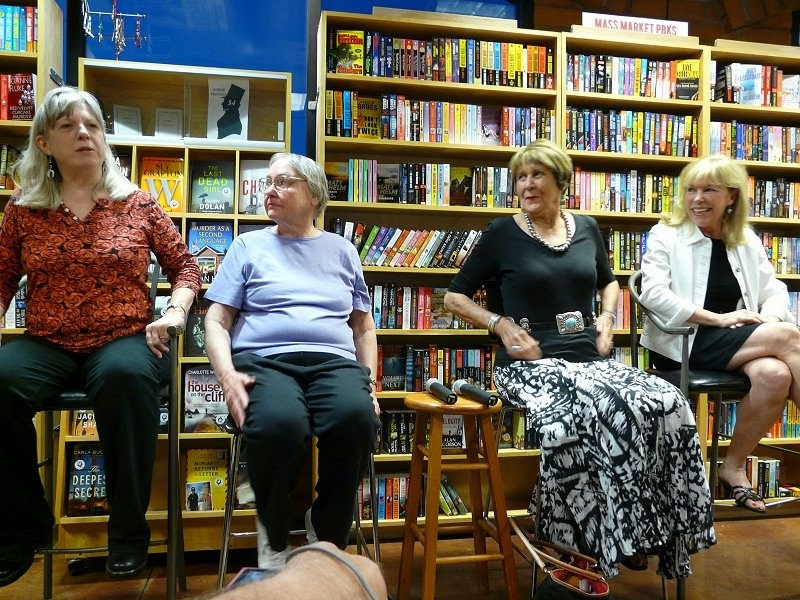 These women have all won awards, and they are all published by Berkley Prime Crime. I wasn't about to pass up the chance to see them, and Denis-- who rocketed through the Wind River mysteries after meeting Margaret Coel-- is always game to go to our favorite bookstore because he usually comes home with more audiobook suggestions. On the drive over, the radio station alerted us to the haboob moving in from Casa Grande. Evidently everyone was supposed to stay off the road at 5 PM, which made me wonder what all these people were going to do instead of coming home from work. Just how much of a chance do you think there would be of having everyone stay at work? I thought so-- you and I are on the same page with that one! The sky was blue, there was no signs of billowing clouds of dust, and in no time, we were at The Poisoned Pen. 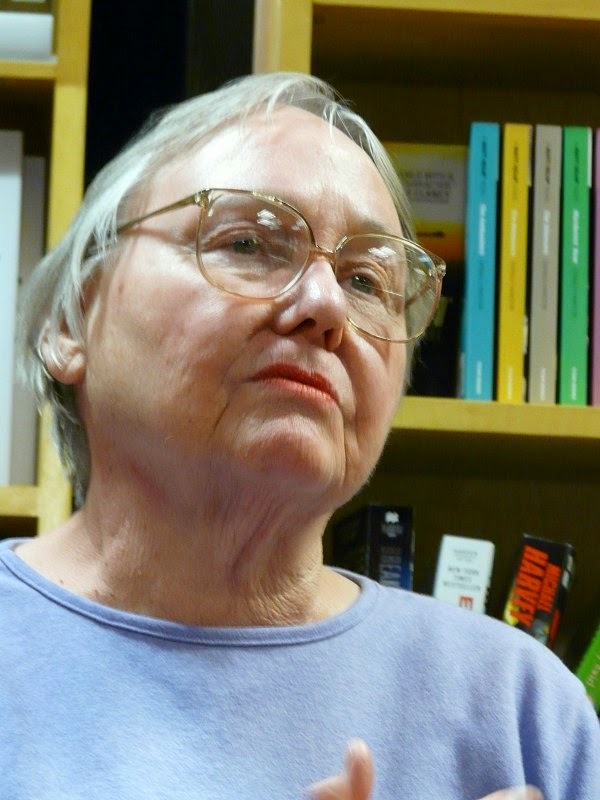 As is often the case, Barbara Peters had taken the women out to lunch, and she looked over the room and said, "You think these authors come to The Poisoned Pen to sign your books. They really come here to eat!" The evening officially began with each author introducing herself. "All the titles in in the second series are quite cheesy," she said with a laugh. "When I began writing the Wind River mysteries," said Margaret Coel, "I had to find a logical way to get an amateur involved in solving murders. Then it dawned on me... when you're in trouble, who do you turn to? You often turn to your priest, your lawyer. "What my books are about is how things that happen in the past percolate up to affect the present." She added that this also happens in her two Catherine McLeod books set in Denver, Blood Memory and The Perfect Suspect. 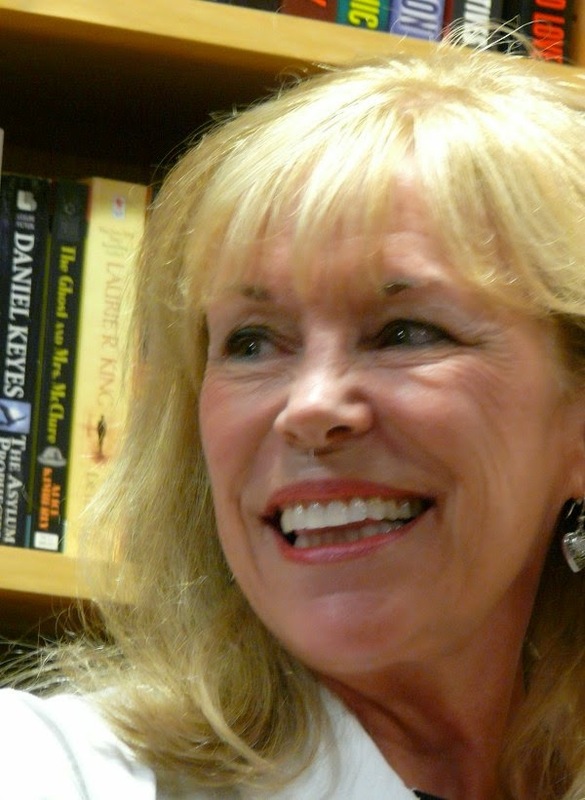 "My Death on Demand book coming out in May will be my fifty-third," said Carolyn Hart. "I've been writing for fifty years. I grew up during World War II and always wanted to write about ordinary people in extraordinary times. "I wanted to write a non-fiction book about American nurses in the Philippines during World War II, but when I asked to see their papers, the papers were not available to view. Now they are, and seven or eight years ago, a wonderful book was written about them. All the nurses survived, although they'd all been Japanese prisoners of war." When Barbara Peters asked her which of her books was her favorite, Hart quickly replied, "Escape from Paris," which is a suspense novel about two American sisters in Paris during the Occupation who risk their lives to save a downed British airman from Nazi arrest. "I feel so intimidated sitting next to Carolyn!" quipped Earlene Fowler. "I wrote each Benni Harper novel as if it were the last. I'm on hiatus at the moment." When asked what she was doing, Earlene smiled and said, "Right now I'm doing promiscuous reading, and I think everyone needs to stop writing for at least six months to give us all a chance to catch up!" Barbara Peters: You all write more than one type of book. Carolyn, you started out with juvenile fiction, and now you're writing about a ghost (Bailey Ruth). It's almost as if you're covering all the bases from birth to death! Carolyn Hart: I had to do copy edits on a new version of a book that's set in Mexico City involving college students in 1954. Doing that made me feel young again. (Looking out over the room) Everybody in this room has a story. Margaret Coel: We all wonder if we can do it. It expands our capabilities, and it's fun. I did it because I wanted to challenge myself. Barbara Peters: Earlene, you write about the thing that scares you most: being widowed. Earlene Fowler: Yes. I had a writing instructor tell us to write about the thing that scares you most, and that's what I did. I met my husband when we were fifteen; we were married when we were nineteen; and we're now fifty-nine with no kids. Well, except our Corgi. I lost twenty-five pounds writing my first book, Fool's Puzzle because the thought of losing my husband scares me to death. Avery Aames: My publisher wanted a niche sort of book about cheese, which has always been considered a sort of comfort food. They wanted cheese, and they liked my writing. I was an actress, and I wrote lots of screenplays, but I had six unpublished novels sitting on the shelf. The only way to be published was to say yes to cheese. And I'm excellent at doing my research! I will say that my cheese shop series isn't so much about cheese but the relationship between an orphaned girl and her French grandparents. My main character can't cook so fans who also can't cook can still relate to the series. Speaking of cooking, if you haven't done so, I hope you all will visit one of my favorite websites, Mystery Lovers' Kitchen. Barbara Peters: The people at Berkley will often have an idea and then look for an author to pair with that idea. In some cases, Berkley owns the name the author writes under. Earlene Fowler: I know of authors who write under four or five different names, and they've dedicated books to themselves. I've often thought that writers have to be successful schizophrenics; they have to write, and then they have to deal with their publishers. 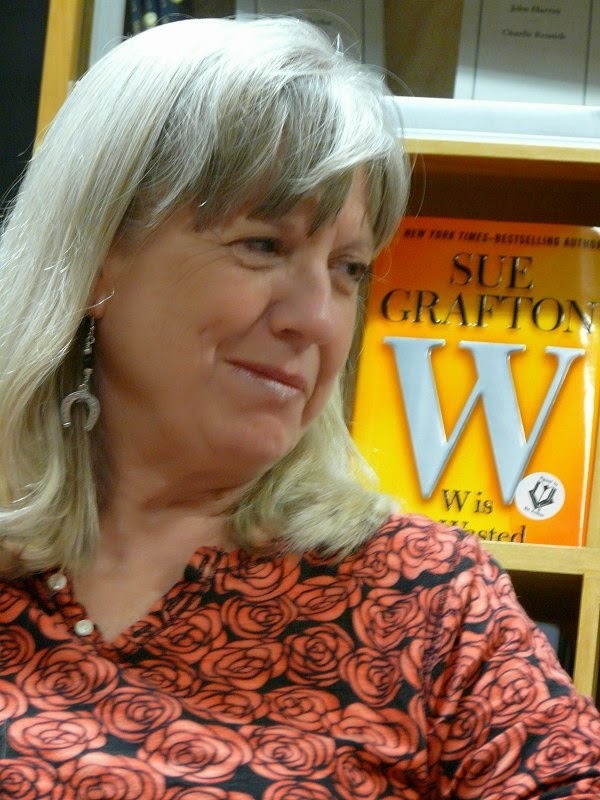 Barbara Peters: Where do you get the names for your characters? Earlene Fowler: From all over. I once met a woman named Bunny. She was six feet tall, dressed in a work shirt, jeans and cowboy boots. Not your run-of-the-mill Bunny! 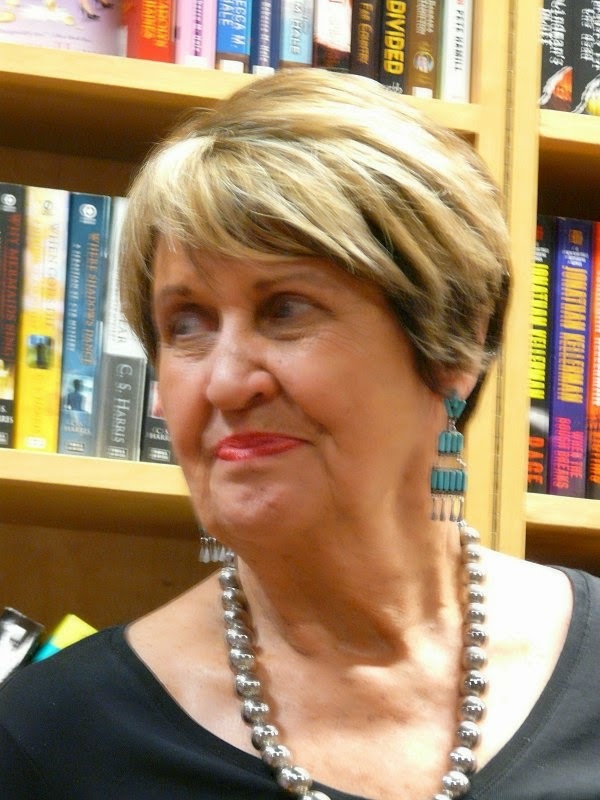 Margaret Coel: I have an Arapaho vet my manuscripts, and I once had to change the name of one of my characters because it was very similar to the name of an Arapaho who would've brought many unhappy memories and associations to the tribe. Avery Aames: I get a lot of mine online. I want them to be easily pronounceable. I met a woman called Bingo at a signing, and I asked her daughter, "Bingo as in the dog?" No. The woman was called Bingo because the very first time her husband laid eyes on her, he said, "Bingo!" Earlene Fowler: I named one of my characters after a real person, and I didn't tell her. Three months later, the woman called me and said, "You named that character after me!" I responded, "'bout time you read the book!" As the evening reluctantly drew to a close, Margaret Coel told us a bit about her newest book that's coming out in September. She found out that Butch Cassidy once hid out on the Arapaho reservation, and an idea sprouted. The book is called Night of the White Buffalo. White buffaloes are very sacred to Native Americans, and when one is born, many times the rancher will kill it immediately. Why? Because thousands of people will come to see it, and they cause traffic jams, trample pasture land, and break down fences in order to do so. A white buffalo can be a very costly occurrence. Then it was all over... but everyone in the bookstore had smiles on their faces. What a fun evening! What a talented group of ladies, Cathy! Lucky you to have gotten the chance to meet them!